Most people are afraid to dance, sing or perform in front of strangers, because they are afraid of being laughed at, teased or judged. But they are not usually afraid when they are among friends. How friendly we are to one another usually depends on how much we know about each other. If I don’t know you, I tend to ignore you. If I know a little about you, I usually acknowledge you with a hello. But if I know a lot about you, I take an interest in you and your activities; I converse, ask you questions, make observations and enjoy being with you. In a classroom where people know each other well and are friendly with one another, they feel free to speak and act in front of the class, to recite and not worry too much about making mistakes or what others think. The message is clear; we are here to learn, we can all help one another and we all make mistakes — that’s the way we learn. Our names are extremely important to us. Names are likewise important to the teacher, the student and the other class members. Knowing each other begins with knowing names. It improves the relationship, shows respect, offers a better learning environment, and increases classroom interaction. It is a crucial first step toward creating a safe, effective learning atmosphere. Here are some fast and easy ways to learn students’ names at the beginning of the school year. After I have had an opportunity to learn your name, check to see if I remember it. If I haven’t, give me a hint, tell me and try me again later. 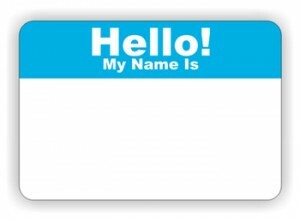 Activities involving and using names and designing nametags can be fun and useful. With primary students a nametag is important and they can learn as they make them. I have them cut pictures of things they “like” to attach to the tag. With older kids, I use autobiographical sketches; paragraphs on aspirations, epitaphs, introductions and interviews. NOTE: I actually use memory devices such as those found in memory courses and books. And I teach divices to two or three kids at a time so that they can teach others and cause others to want to learn the devices. The public declaration of my learning intention, puts some pressure on me to perform and makes a kind of game of it. Students check on me saying things like, “I’ll bet you don’t know my name.” I tease them with the wrong name, and in general we have some fun with it; all of which aids in the memorization process for all. Take Polaroid pictures of groups or “tables,” label the pictures and study them. For high school students, making drivers licenses, passports, ID cards or “admission tickets.” you can use photocopies of previous “school Pictures.” There are many creative ways to display or use these devices. There are several “Ice-Breaker” type activities that are excellent for the whole class getting to know each other, becoming friendlier and remembering all the names. Have the members introduce themselves and “sign ilf’ on the board, the “wait” time for walking to and from the board is valuable. And a statement about what they think they know about the subject or what they look forward to in the course, will help make then memorable. Students systematically stand and introduce themselves by their first names and use a word that rhymes with their name or use an adjective that begins with the same letter as their name. For instance, Anna Banana, Eddie Spaghetti, or Angelic Alicia, or Terrific Tyrone. Using teams of 4-6 seated in circle, each one gives his name and makes a statement about himself, the next one repeats the name and statement, and adds his own. For example, “My name is Jennifer and I hate English,” The next student repeats and adds, “My name is Jason, I’m good in Math7 As they have a laugh or two, and prompt each other, they learn. Later the teams can interact to learn names. Taking time to do variations of the “Name Game” will teach names and be enjoyable. Have 6 people introduce themselves and then line up in front. The teacher asks, “Which is Jeffery?” or “Point to Barbara.” More kids introduce themselves and the game continues. A couple of minutes each day for the first week or two of school will reinforce their memory. For a primary class a video camera, (if you can’t get one, a tape recorder will do) is a good way to start. Ask each one several question, or otherwise get them to tell some things about themselves. This serves as an introduction and then can be kept as a “before” picture in their portfolio. Have students “sign-in” as a way of taking attendance for the first week. Wait until every one is seated then let them go to the board one at a time and print in large letters, as they check off the roster. Because I know everyone’s name, I do not use a seating chart (The way “everyone” learns student’s names.) To me seating charts are very restrictive both for me and for the kids. Not using a seating chart permits kids the freedom to sit anywhere and does not require seats to be in rows, or have kids facing the backs of each other’s heads. It also permits kids to lie on the floor, be in clusters, sit on the windowsill and rearrange themselves. I also let the students take their own attendance, which I verify as the last one to check the roster, records the names of those absent on the attendance slip. Keep up with Gazette articles on Pinterest! This entry was posted on Thursday, August 1st, 2013 and is filed under *ISSUES, August 2013, Bill Page. You can follow any responses to this entry through the RSS 2.0 feed. Both comments and pings are currently closed.